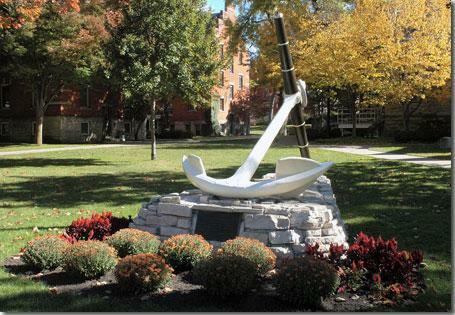 The Holland community will have a new opportunity this fall to explore a literary work in-depth through events and discussion, thanks to a second consecutive award to Hope College through “The Big Read,” a program of the National Endowment for the Arts (NEA) in partnership with Arts Midwest. This year’s program will focus on “The Things They Carried,” Tim O’Brien’s semi-autobiographical collection of short stories based on his experiences serving in the 23rd Infantry Division during the Vietnam War. Coordinated by Hope in partnership with Herrick District Library, it will run across the first three weeks of November, building on the success of last year’s popular exploration of “To Kill a Mockingbird,” which had also received a grant through the NEA and Arts Midwest initiative. “The Big Read,” which is managed by Arts Midwest, is designed to revitalize the role of reading in American culture by exposing citizens to great works of literature and encouraging them to read for pleasure. Hope is one of only 75 non-profit organizations nationwide to receive a grant to host a “Big Read” project between September 2015 and June 2016. “The Big Read” provides communities nationwide with the opportunity to read, discuss, and celebrate one of 37 selections from U.S. and world literature. The 75 selected organizations will receive Big Read grants to promote and carry out community-based reading programs featuring activities such as read-a-thons, book discussions, lectures, movie screenings, and performing arts events. The NEA has also developed high-quality, free-of-charge educational materials to supplement each title, including reader’s guides, teacher’s guides, and audio programming, all of which are available to the public at neabigread.org. The NEA awarded Hope $16,200 for the Holland-area event. Hope and the other participating organizations will match the grant with additional financial and in-kind support. O’Brien, who will deliver a keynote address at Hope on Thursday, Nov. 19, served in Vietnam during 1969 and 1970, and has written multiple books about the war. Published in 1990, “The Things They Carried” centers on a platoon of soldiers through several self-contained stories narrated by O’Brien. Among other honors, it was a finalist for the National Book Critics Circle Award and the Pulitzer Prize, and won France’s Prix du Meilleur Livre Etranger (Best Foreign Book Prize) and the Chicago Tribune Heartland Prize. The three-week program in Holland will feature several main events and book discussions hosted by a variety of community organizations. The activities will begin on Monday, Nov. 2, at the Park Theatre with a kick-off event and lecture by Dr. Fred Johnson of the Hope history faculty, who is a specialist in military history. In addition to the opening celebration and the Nov. 19 keynote address by O’Brien, events will include screenings of films related to themes explored in the book, a panel discussion featuring veterans, a musical performance featuring Vietnamese musician Vanessa Vo and readings from the book, and an art reception featuring work by area high school students created in collaboration with local artist Joel Schoon Tanis. The organizers also anticipate at least 15 public book discussions and 15 private book discussions. As during the 2014 event, they plan to distribute hundreds of free copies of the book to students and community members. Established by Congress in 1965, the National Endowment for the Arts is the independent federal agency whose funding and support gives Americans the opportunity to participate in the arts, exercise their imaginations, and develop their creative capacities. Through partnerships with state arts agencies, local leaders, other federal agencies, and the philanthropic sector, the NEA supports arts learning, affirms and celebrates America’s rich and diverse cultural heritage, and extends its work to promote equal access to the arts in every community across America. More information is available at arts.gov. Arts Midwest promotes creativity, nurtures cultural leadership, and engages people in meaningful arts experiences, bringing vitality to Midwest communities and enriching people’s lives. Based in Minneapolis, Arts Midwest connects the arts to audiences throughout the nine-state region of Illinois, Indiana, Iowa, Michigan, Minnesota, North Dakota, Ohio, South Dakota and Wisconsin. One of six non-profit regional arts organizations in the United States, Arts Midwest’s history spans more than 25 years. More information is available at artsmidwest.org.